Happy Bloggers Challenge Friday! If you're still looking for ideas for your loved ones for Valentine's Day, your in luck! Today's Bloggers Challenge Theme is Valentine's. No frilly Valentine's would work for my DH, instead I actually used one of his magazines to create my card. I used the Zine Piecing Technique from the currrent TJNL, to add color to the tent. I tell you, you'll never look at magazines the same way once you start using this technique! 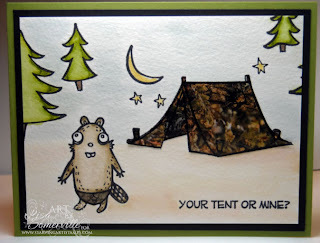 The cute images are from StarvingArtistamps DoodleFactory line. To finish my card, I used the Marker Watercoloring Technique, then added some Marker Washing to fill in the background. My card also does double duty this week, as it fits the LOVE theme for the Stampotique Designers Challenge this week. Be sure to stop by and see what the other challenge players created by clicking on the Bloggers Challenge Logo on my sidebar. Wishing you a Chocolate, Flower filled Valentine's! LOL! Great valentine for the outdoorsy woodsman! Very cute! Lisa this is absolutely fabualous...I agree with you on the magazines...I have been hording for a year now.. This card made me laugh out loud...definitely a card any DH would appreciate ;-)! Too cute! Love how it's so different than you traditional love card! Thanks for playing with us at SDC this week! he he, love this one! And the tent is super cool! Thanks for joining us at Stampotique as well. Great card for DH! Hope you have a great VD! How cute! This one made me laugh as it's just so fun and different from the usual hearts/flowers. Perfect MAN card...your hubby will love it I'm sure! Great job! hehehehe...this made me smile. Love the card, I know your hubby will too. I just love that you incorporated J's own mag into his card! You go, clever girl! Happy Valentine's Day!! Adorable, Lisa! Love the look of the tent. Too cute! Love the tent made from the magazine. I think Jim will love it! Love this sweet stamp set and scene!! Makes for a great man valentine!! Love the card you made. Perfect for your man!! Check out my card - valentine doggies! I'm LOL right now! What a cute little project! Just love it!!! Lisa - this is such a FUN card! Love the sentiment! CUTE! Would be a great man valentine! I love the rich colors. Beautiful job Lisa!